Astronomy and Space News - Astro Watch: How Do You Weigh a Galaxy? Especially the One You're In? A new technique for estimating the mass of galaxies promises more reliable results, especially when applied to large datasets generated by current and future surveys, according to a research team led by Ekta Patel at the University of Arizona. Published in the Astrophysical Journal, the study is the first to combine the observed full three-dimensional motions of several of the Milky Way's satellite galaxies with extensive computer simulations to obtain a high-accuracy estimate for the mass of our home galaxy. Determining the mass of galaxies plays a crucial part in unraveling fundamental mysteries about the architecture of the universe. According to current cosmological models, a galaxy's visible matter, such as stars, gas and dust, accounts for a mere 15 percent of its mass. The remaining 85 percent is believed to reside in dark matter, a mysterious component that never has been observed and whose physical properties remain largely unknown. The vast majority of a galaxy's mass (mostly dark matter) is located in its halo, a vast, surrounding region containing few, if any, stars and whose shape is largely unknown. In a widely accepted cosmological model, dark-matter filaments span the entire universe, drawing luminous ("regular") matter with them. Where they intersect, gas and dust accumulate and coalesce into galaxies. Over billions of years, small galaxies merge to form into larger ones, and as those grow in size and their gravitational pull reaches farther and farther into space, they attract a zoo of other small galaxies, which then become satellite galaxies. Their orbits are determined by their host galaxy, much like the sun's gravitational pull directs the movement of planets and bodies in the solar system. "We now know that the universe is expanding," says Patel, a fourth-year graduate student in the UA's Department of Astronomy and Steward Observatory. "But when two galaxies come close enough, their mutual attraction is greater than the influence of the expanding universe, so they begin to orbit each other around a common center, like our Milky Way and our closest neighbor, the Andromeda Galaxy." Although Andromeda is approaching the Milky Way at 110 kilometers per second, the two won't merge until about 4.5 billion years from now. According to Patel, tracking Andromeda's motion is "equivalent to watching a human hair grow at the distance of the moon." Because it's impossible to "weigh" a galaxy simply by looking at it — much less when the observer happens to be inside of it, as is the case with our Milky Way — researchers deduce a galaxy's mass by studying the motions of celestial objects as they dance around the host galaxy, led by its gravitational pull. Such objects — also called tracers, because they trace the mass of their host galaxy — can be satellite galaxies or streams of stars created from the scattering of former galaxies that came too close to remain intact. Unlike previous methods commonly used to estimate a galaxy's mass, such as measuring its tracers' velocities and positions, the approach developed by Patel and her co-authors uses their angular momentum, which yields more reliable results because it doesn't change over time. The angular momentum of a body in space depends on both its distance and speed. Since satellite galaxies tend to move around the Milky Way in elliptical orbits, their speeds increase as they get closer to our galaxy and decrease as they get farther away. Because the angular momentum is the product of both position and speed, there is no net change regardless of whether the tracer is at its closest or farthest position in its orbit. "Think of a figure skater doing a pirouette," Patel says. "As she draws in her arms, she spins faster. In other words, her velocity changes, but her angular momentum stays the same over the whole duration of her act." The study, which Patel presents on Thursday, June 7, at the 232nd meeting of the of the American Astronomical Society in Denver, is the first to look at the full three-dimensional motions of nine of the Milky Way's 50 known satellite galaxies at once and compare their angular momentum measurements to a simulated universe containing a total of 20,000 host galaxies that resemble our own galaxy. Together those simulated galaxies host about 90,000 satellite galaxies. Patel's team pinned down the Milky Way's mass at 0.96 trillion solar masses. Previous estimates had placed our galaxy's mass between 700 billion and 2 trillion solar masses. 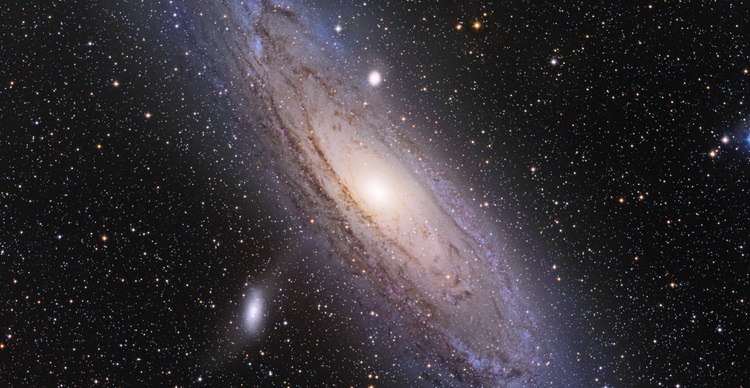 The results also reinforce estimates suggesting that the Andromeda Galaxy (M31) is more massive than our Milky Way. The authors hope to apply their method to the ever-growing data as they become available by current and future galactic surveys such as the Gaia space observatory and LSST, the Large Synoptic Survey Telescope. According to co-author Gurtina Besla, an assistant professor of astronomy at the UA, constraints on the mass of the Milky Way will improve as new observations are obtained that clock the speed of more satellite galaxies, and as next-generation simulations will provide higher resolution, allowing scientists to get better statistics for the smallest mass tracers, the so-called ultra-faint galaxies. "Our method allows us to take advantage of measurements of the speed of multiple satellite galaxies simultaneously to get an answer for what cold dark matter theory would predict for the mass of the Milky Way's halo in a robust way," Besla says. "It is perfectly suited to take advantage of the current rapid growth in both observational datasets and numerical capabilities."